Tired of the default download manager setup in Firefox and wanting something more? Now you can modify the download manager to suit your own personal style with the Download Manager Tweak extension. Once you have installed the extension and restarted Firefox, there are two methods for accessing the options (nice!). The first method is through the Add-ons Manager Window and is shown here. This is the better of the two options if you are wanting access to all options in one window. 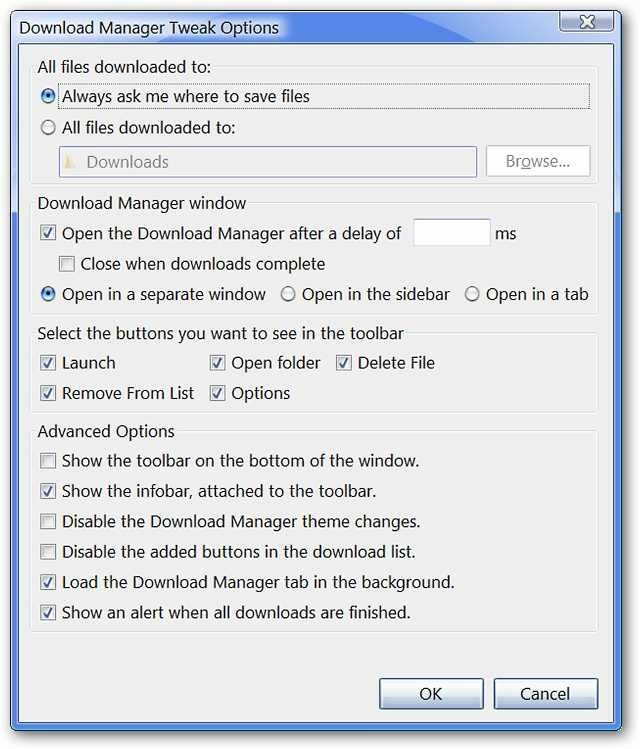 You can manage the default download location, options for the download window configuration (i.e. separate window, sidebar, or new tab), commands/buttons to be included in the toolbar, and advanced options (i.e. toolbar location, infobar display, theme changes, additional buttons, alerts). 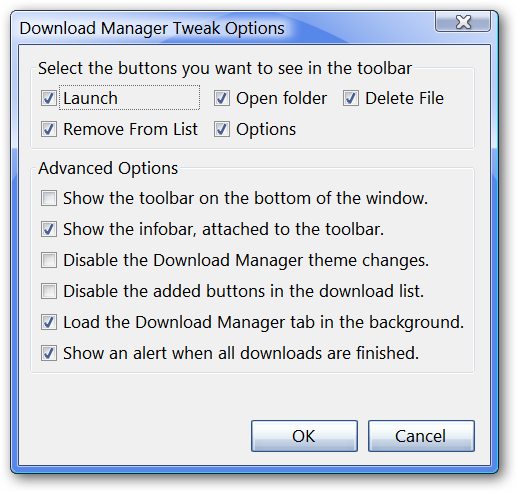 The second method for accessing the options for Download Manager Tweak is through the Options Window. It will be the last “tab” area in the window. Notice that part of the options are displayed directly in the Options Window…to access the additional options you will need to click on “Advanced Options”. Once you click on “Advanced Options”, this is the window that you will see. Here are the remainder of the options that you may want to modify to best suit your purposes. Once you have the Download Manager set up to suit your preferences and start to download an item, you will see that download information displays in the lower right corner of your browser window. 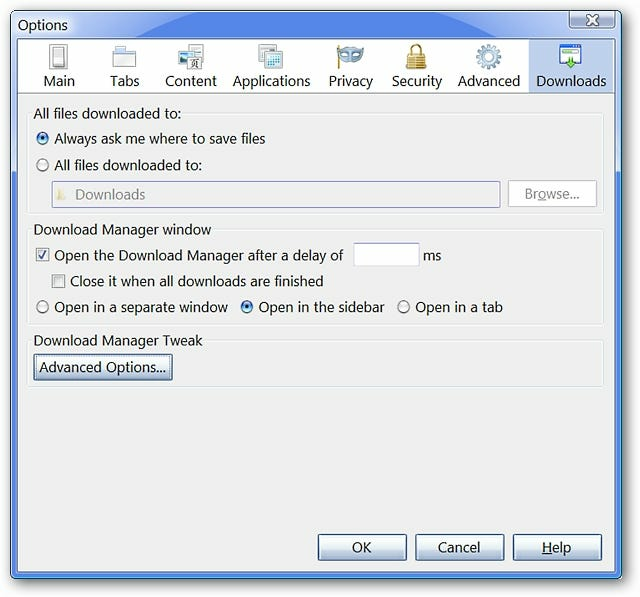 Click on the download information display to access your Download Manager Window. If you selected to have your downloads display in a separate window, this is what it will look like with all toolbar options and the infobar enabled. 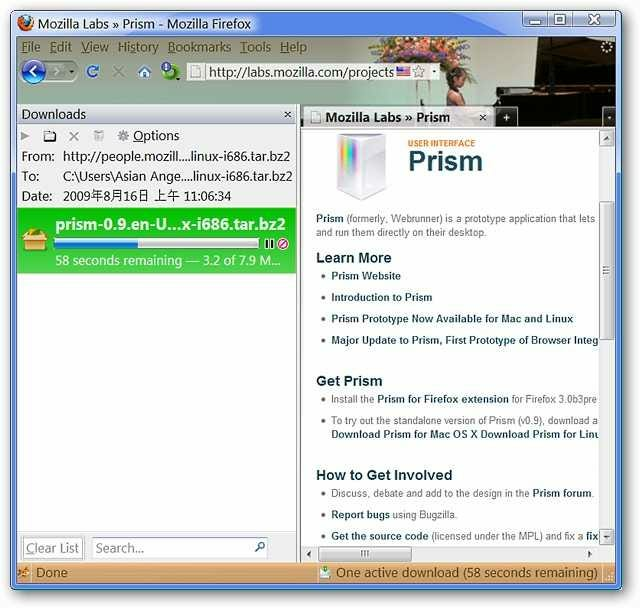 It is very similar to the default download window but does have the additional components. If you like the tab option, downloads will display in a new tab (very nice!). This can be an extremely useful add-on if you are looking to keep all of your activity contained in your browser window or if you are just looking for an enhanced downloading experience.